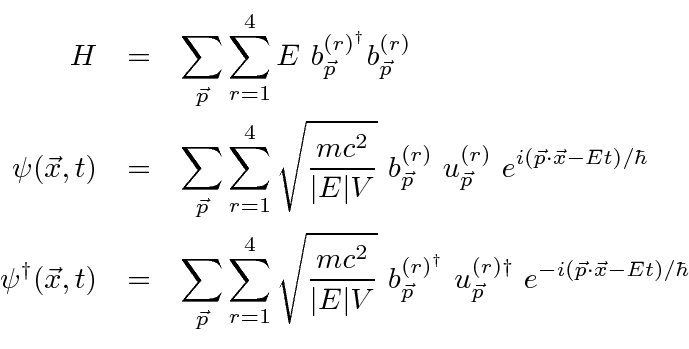 To proceed toward a field theory for electrons and quantization of the Dirac field we wish to find a scalar Lagrangian that yields the Dirac equation. 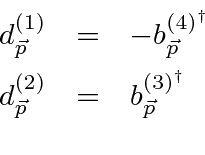 From the study of Lorentz covariants we know that is a scalar and that we can form a scalar from the dot product of two 4-vectors as in the Lagrangian below. The Lagrangian cannot depend explicitly on the coordinates. 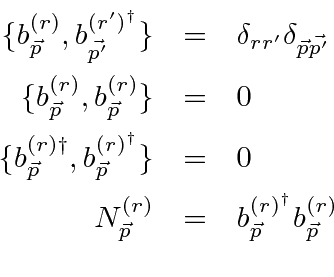 (We could also add a tensor term but it is not needed to get the Dirac equation.) The independent fields are considered to be the 4 components of and the four components of . 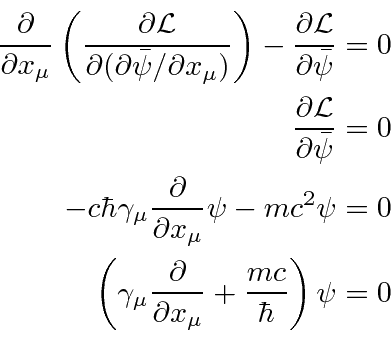 The Euler-Lagrange equation using the independent fields is simple since there is no derivative of in the Lagrangian. The Hamiltonian density may be derived from the Lagrangian in the standard way and the total Hamiltonian computed by integrating over space. 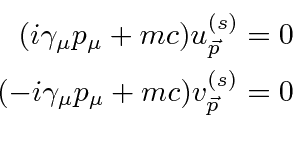 Note that the Hamiltonian density is the same as the Hamiltonian derived from the Dirac equation directly. We may expand in plane waves to understand the Hamiltonian as a sum of oscillators. By analogy with electromagnetism, we can replace the Fourier coefficients for the Dirac plane waves by operators. The creation an annihilation operators and satisfy anticommutation relations. is the occupation number operator. The anti-commutation relations constrain the occupation number to be 1 or 0. The Dirac field and Hamiltonian can now be rewritten in terms of electron and positron fields for which the energy is always positive by replacing the operator to annihilate a ``negative energy state'' with an operator to create a positron state with the right momentum and spin. Now rewrite the fields and Hamiltonian. All the energies of these states are positive. There is an (infinite) constant energy, similar but of opposite sign to the one for the quantized EM field, which we must add to make the vacuum state have zero energy. Note that, had we used commuting operators (Bose-Einstein) instead of anti-commuting, there would have been no lowest energy ground state so this Energy subtraction would not have been possible. Fermi-Dirac statistics are required for particles satisfying the Dirac equation. Since the operators creating fermion states anti-commute, fermion states must be antisymmetric under interchange. Assume and are the creation and annihilation operators for fermions and that they anti-commute. The states are then antisymmetric under interchange of pairs of fermions. Its not hard to show that the occupation number for fermion states is either zero or one. Note that the spinors satisfy the following slightly different equations.